The last word in ugliness. Really. 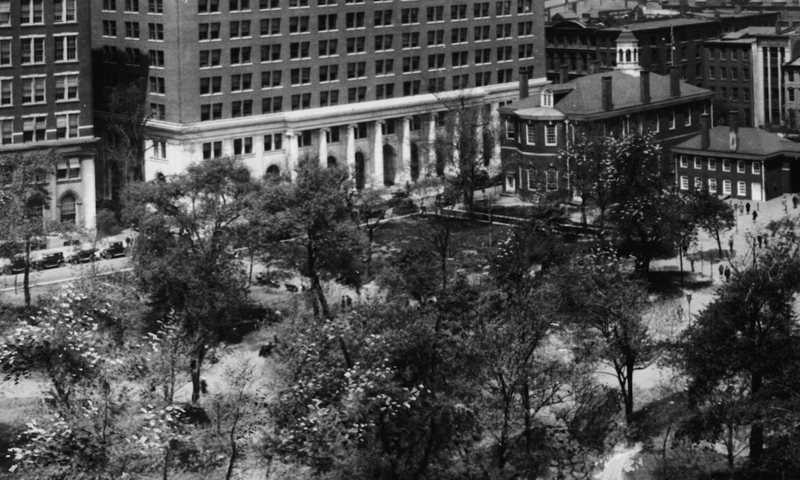 In the photo, above, taken in the early 1920s, you can see the dark ghost of the footprint of a demolished building, just to the south of Congress Hall and just across from the new Public Ledger Building. (Click on this, or any photo, to see a larger image.) Today, there’s no trace of it at all, but, for about 40 years, the city’s much maligned “New Courthouse” stood on that spot. 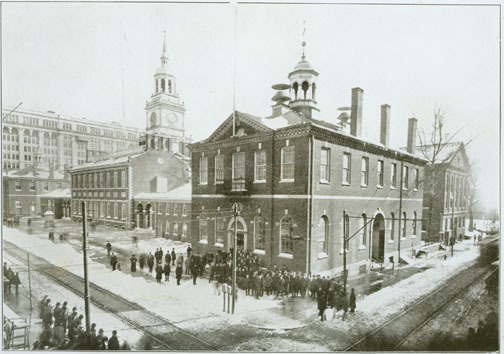 In December, 1865, after lengthy debate, the Philadelphia City Councils approved an ordinance which provided $35,000 for the erection of “a building on on Sixth Street, below Chestnut, to be used as the Court House for the Quarter Sessions.” Only ten weeks later, ground was broken for what was to be called the “New Courthouse;” the old one was Congress Hall, then being used by the county. See the 1895 map, below. Only a few days after the groundbreaking, John McArthur Jr., who would later design Philadelphia’s new City Hall, presented an objection. He argued that any construction would be in direct violation of an 1816 law, which had granted the use of the land as perpetual open ground, and stipulated that no building be erected there, but that it “Shall be enclosed and remain Public Green and Walk for ever.” Oddly enough, this is the same John McArthur Jr. who, in 1870, came up with the design, below, for a new City Hall on Independence Square that would have filled the entire block, swallowing everything except for the State House. The new Court House, although not presenting a very imposing appearance so far as the exterior is concerned, will nevertheless give us a court room as complete as any in the State. The first floor is devoted to the Grand Jury and the Clerk of Court. On the south side are two offices for the District Attorney, a male and female witness room, and one large room for the Grand Jury. On the north side is a private office for the Clerk of Quarter Sessions. The “New Courthouse” in 1895, looking north east. 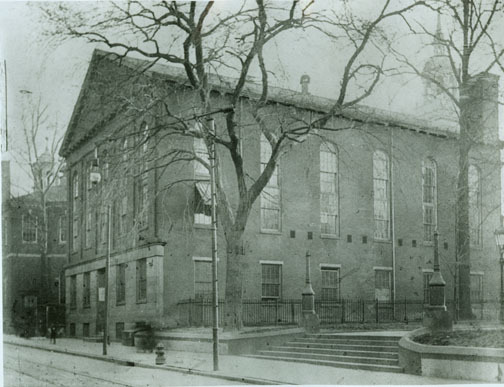 Throughout the second half of the 19th century, the New Courthouse served not only as home to the Court of Quarter Sessions, but as the meeting place for the Public Buildings Commission, formed to oversee the construction of the new City Hall in Penn Square. Thirty-three years after completion, the building was used as the headquarters for the sergeant-at-arms of the Republican National Convention. In 1921, while restoration work was being done on Old City Hall, a tunnel was discovered that ran from the prisoner holding cells there all the way across the square to the New Courthouse. 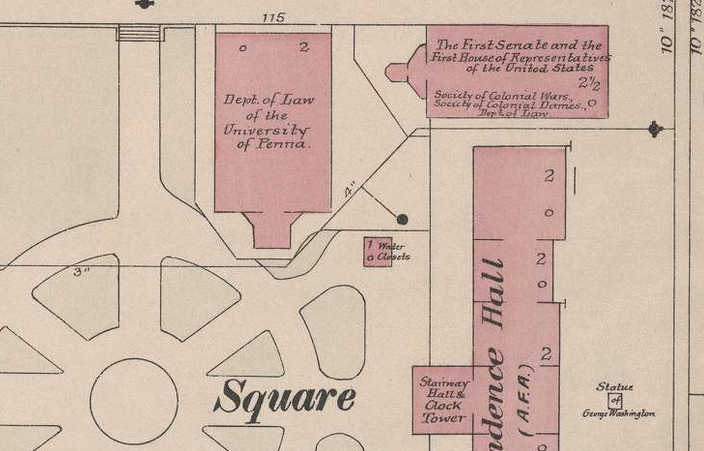 By the late 1890s, most city court functions had moved to the new Public Buildings at Penn Square. In its final role, the Old Courthouse served as the home of the 12,000 volume Library of the Law Department of the University of Pennsylvania, below. The library was moved to West Philadelphia when the new Law Department Building (Silverman Hall) was completed in 1900. The barn-like old court house was demolished soon after. The Civil War stands as a great dividing line between the aesthetic in architecture and the grossly material. A fine example of the progressive decay used to be afforded by a comparison between the State House with its many fine characteristics and the “New Court House” on Sixth Street, which was the last word in ugliness. 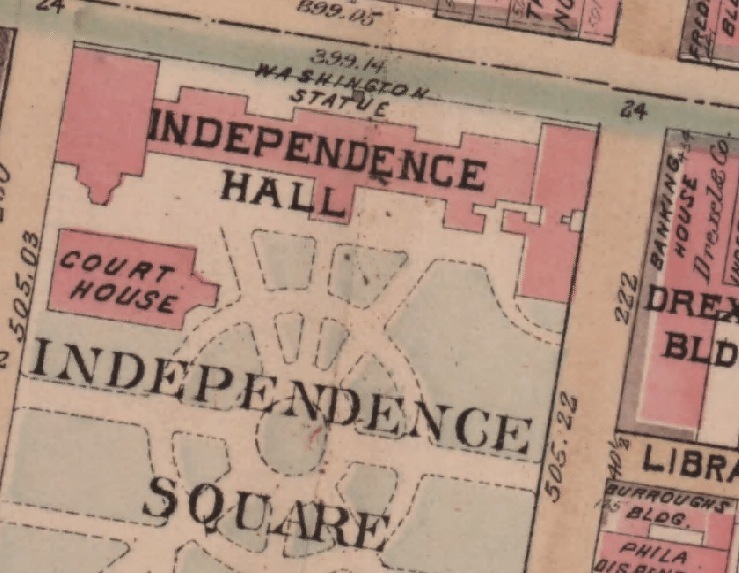 *I first noticed the New Courthouse on the 1895 map on the wonderful Greater Philadelphia GeoHistory Network website. Photos or illustrations of the building were very difficult to find. Many thanks to Andrea Ashby, the Library Technician at the Library and Archives at Independence National Historical Park, for the two rare photos, above.